Lack of IMAGINATION (the opposite is NARCISSISM; self involvement) Does this imply that personal creativity is tied to overcoming our personal selfishness??? If so, I recommend The Artist’s Way, by Julia Cameron! The document titled “The Coming Revolution” lays out a paradigm shift that is taking place within society today. In fact, many people have recognized the possibility of human change. Albert Einstein said that, “The significant problems that we face today cannot be solved at the same level of thinking that we were at when we created them.” This shows a belief in humankind’s ability to transcend one’s thinking in the process improve one’s conditions. With the coming revolution this shift has several principles that may work in unison to solve the difficult problems that we find ourselves faced with. In the film, Mindwalk, we were thoroughly introduced into a scientific perspective of a shift in the old Cartesian/Newton mechanistic thinking of the last three hundred years that while beneficial and even transcending for much of man’s experience of that time had strong limitations that have permeated society today. This old thinking led people to see everything and everyone as machines with parts that could be dissected and once understood would give the dissector the knowledge of the whole. Heisenberg’s uncertainty principle opened a new way of seeing the world. In quantum physics while attempting to see an atom’s parts up close, scientists were not able to look at an electron without disrupting its orbit. This led scientists to see that the experimenter had become part of the experiment. Many scientific ideas were also questioned with the deeper understanding of the atom. They found that much of an atom is made up of empty space. This changed the notion that everything is composed of matter. Now scientists understood that things are interconnected and composed through probability patterns and are interacting with other forces. Bateman asked the question where man ends and his environment begins. The answer is that we are part of our environment and our environment is part of us neither disconnected from the other. This notation in itself brings a person to believe that once we see how we too are interconnected with the earth and life on the earth that it will be more difficult to see other people as them versus us. A mentality that has led to the justification of violence. On the other hand, this new realization should lead us to a new found love and responsibility to see that all are treated justly. Another principle of the coming revolution is abundance consciousness. In the past, modern man has used scarcity thinking to create an atmosphere of fear. This fear could be that there is only so many resources to go around for the populations of the earth. This has led many to a strong need to compete for those limited resources. Many unequal relationships between people have been set up as some people have used that competition to become stronger and take more and more of the resources discounting the others who do not compete as well as weak and therefore not as deserving of the resources. By contrast, abundance thinking will believe in people’s creativity while affirming that they are good enough to solve the issues that are placed before them. A good example of abundance consciousness was the conversation and mindset of the Truth and Reconciliation Commission talked about in Pumla’s A Human Being Died that Night and the film Long Night’s Journey into Day. While attempting to break a vicious violence cycle in South Africa, Tutu, an African bishop helped transform the structure of justice by integrating two African cultural values into the commission. First, the benefit of mutual trust or reconciliation and second, truth or accountability. The foundation of this commission was a deeper belief in the ability of those who have been wronged to not only receive justice themselves but also gave them the opportunity to forgive their victimizers which in turn would give a certain sense of transcending the acts of violence and changing as well. In order to subscribe to this idea one must truly see both parties as possessing the abilities to change the challenging and horrific events that they had encountered together. Furthermore in order to see significant social change, Friere’s Pedagogy of the Oppressed shows a shift in teaching through liberation theology. Friere walks the reader through a process of how education can liberate someone who has been oppressed. First he explains how the oppressor and the oppressed both lose their humanity in the vicious cycle of oppression. Fredrick Douglass explained that no slave owner could maintain his humanity while possessing a slave. He talked about how one of his slave holders had been a gentle and kind woman when he first came to live with her. She had even began to teach him the alphabet. He explained that through the process of oppressing him, she became calloused and tainted by the tyranny that she acted on in order to try to keep him ignorant. Friere wanted the reader to understand the difference between the “banking” method of teaching and the “dialogue” method of teaching. Banking stressed the teacher (the subject) being superior to the student in every way and led to an educator pouring his/her ideas into his empty student (the object). The dialogue method of teaching was cooperative, unity liberation, organized, and used cultural synthesis. This was the idea that the teacher had as much to learn as the student and that he must have humility, faith, hope, and this would lead to critical thinking and the freeing of the oppressed one’s mind. The other idea that Friere believed was that the oppressed was the only one with the power to free himself and the oppressor. In deep democracy, every persons voice would matter and everyone’s voice would be heard. In Nashville’s Warriors, during the march, Diane Nash asked Nashville’s mayor two questions. First she asked him something like this, “Is it right for people to be treated differently solely on the basis of the color of their skin?” and second, “Should then, something be done to end segregation?” At this point in the movie they were transcending the current world view or system that they were both engaged in and had a meeting of the minds at a level were Nash, the symbolic view of the African-American experience of that day was heard. This also showed a great example that nonviolence can work as an alternative when creating social change or a revolution. Gandhi gave excellent examples of pacifism as he taught how organized noncooperation can profoundly influence and change a political system without the bloody revolution that Che’ felt was necessary. The Primer of Pacifism explained that most people prefer nonviolent means but feel that it is an impractical idea. Also that pacifism requires other ideas such as hard work, organization, political savvy, provocative ideas, and etc. 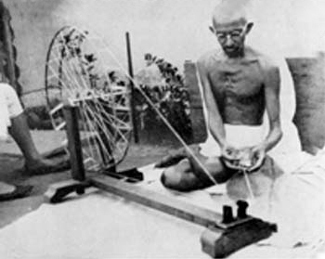 In the film, we saw Gandhi stand up as a young lawyer and teach a crowd of many Indians a practical application for how not to allow one’s dignity to be taken from them through pacifism. In “Seeking the Truth,” Hill explains many principles that will be helpful in this Coming Revolution. As I read this document I thought of how this event coincides with what Covey calls the moving from the “industrial age” into what we now are in the “knowledge worker age” and finally in the future what will be the “wisdom age.” This age would incorporate all of these fundamental principles and attitudes toward all humankind in a way that would transcend the current predicaments that we find ourselves in today through the ability to utilize the full capacity of God’s greatest creation, all of man’s talents and abilities or in turn, his potential for extreme acts of goodness. I was very happy to search out this net-site. I wished to thanks on your time for this excellent learn!! I undoubtedly enjoying every little little bit of it and I have you bookmarked to check out new stuff you blog post. Thank you Kendra. Your comment was hidden in my spam folder, so I apologize for the delayed response. I am glad that you got some good information from this post and will be back! The class that I wrote this paper for was difficult to make it through for many folks and it wasn’t because the concepts were hard to understand intellectually, but I believe it was because they were hard to understand culturally. There are definitely plenty of details like that to take into consideration. That could be a great level to bring up. I offer the ideas above as normal inspiration however clearly there are questions just like the one you convey up the place an important thing might be working in trustworthy good faith. I don?t know if finest practices have emerged around issues like that, however I am sure that your job is clearly recognized as a good game. Each boys and girls really feel the affect of just a second’s pleasure, for the rest of their lives. Thank you for your feedback and reply Marx. I only found it hidden in my spam folder this morning. I would love to hear more details on your thoughts as well.